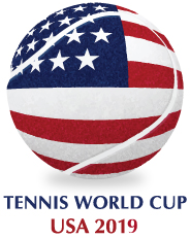 The Format of matches taking place at the Tennis World Cup is not the same as the format used on the ATP/WTA Tour or ITF matches. There are no sets in Tennis World Cup ties: each match is made up of games that take place over a fixed time period totalling 80 minutes. The winner of the match is the Nation that has won the most games during that time period. A match is a Group Stage or Knockout Phase tie between two teams of 2 females and 2 males representing their Nation in the Tennis World Cup. So for example depending on the coin toss and the winning Captain’s decision the First Quarter may be Men’s Singles, followed by Mixed Doubles, followed after the Half-Time break with Mixed Singles, and then finishing the match with Women’s Singles. The score in games at the end of the 1st Quarter is carried over to the start of the 2nd Quarter. So for example if Nation A is ahead 3-2 after the Women’s Singles Quarter then that will be the score that the Men’s Singles starts on. If Nation B wins four games during the Men’s Singles and Nation A wins two then the score at the end of the 2nd Quarter will be 6-5 in favour of Nation B – and that will be the Half-Time score and the score that the 3rd Quarter starts on. If Nation B wins 4 games and Nation A wins 3 in the Mixed Doubles 3rd Quarter then the score at the end of that Quarter will be 10-8 in favour of Nation B and that will be the score that the 4th Quarter starts on. If Nation A wins 4 games in the Mixed Singles 4th Quarter and Nation B wins 2 then the final score will be 12-10 in favour of Nation A, who wins the match. The winner of each game is the first to get to 40 points and then win the next point. There are no Deuce points in Tennis World Cup matches. Matches are to begin at 5 minutes past the hour after a 5 minute warm-up period. Between Q1 and Q2 there is a five minute break. After Q2 there is a ten minute Half-Time break. Between Q3 and Q4 there is a five minute break. In the Group Stage if the scores are the same for each Nation at the end of 80 minutes then the result is a draw and each Nation is awarded one point. However if scores are level in a Knockout Phase match then a Tennis World Cup Tie-Break is played. If the scores level after 80 minutes one additional game is played in the format of Mixed Doubles but this time with the game going to Deuce if the score is 40-40. There are two phases of a Tennis World Cup: a Group Phase and a Knock-Out Phase. The Group Phase consists of four groups of three Nations. Each Nation will play the other two Nations in its group. Each group will therefore produce three matches. The winning nation of each Match in the Group Phase will be awarded two points. Nations that are level on games won after the 80 minutes match duration will each get one point. The top two nations in each group will qualify for the Knockout phase of the Tournament. Greater number of games won. Greater number of points won. Highest number of combined ranking points for all four players. The Knockout Phase will begin with the eight teams that qualified from the Group Phase playing the Quarter Finals, then the Semi Finals, then the Final.